Characteristic of bog mats, persisting in some shade; interdunal swales and hollows, poor fens. Often forms dense stands ringing the open water of a bog pond. Unlike the circumpolar V. oxycoccos, this is a strictly North American species. 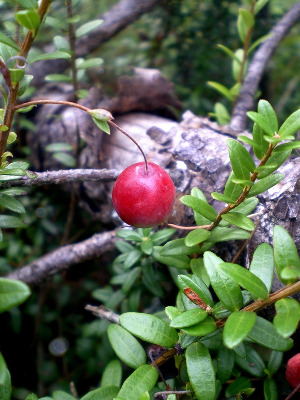 The leaf blades tend to be more elliptic-oblong or even slightly spatulate in comparison with those of our other cranberries. The leaves, flowers, and fruits average a little larger. Occasionally the two (usually ± opposite) bracts on the pedicels are ambiguous, e.g., relatively narrow and reddish in V. macrocarpon, resembling large ones of V. oxycoccos. Additional points of distinction in the field are these: (1) The stems in V. macrocarpon are usually prolonged well beyond the flowers or fruit, while in V. oxycoccos the flowers and fruit usually appear to be terminal or nearly so, without a prolonged leafy shoot. (2) V. oxycoccos blooms about a month earlier, generally in June or sometimes as late as mid-July in the Upper Peninsula; V. macrocarpon blooms in July, or sometimes as early as mid-June in southern Michigan. Our two cranberries are sometimes segregated as the genus Oxycoccus. MICHIGAN FLORA ONLINE. A. A. Reznicek, E. G. Voss, & B. S. Walters. February 2011. University of Michigan. Web. 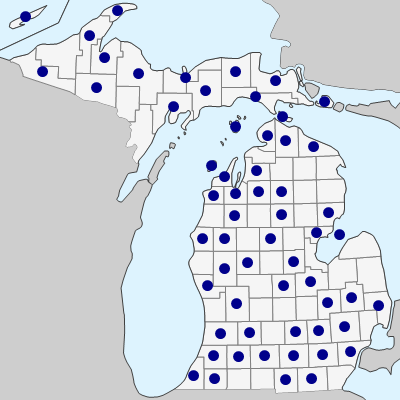 April 21, 2019. https://michiganflora.net/species.aspx?id=1234.